You are here: Home » GENRE » Fantasy » Fantastic Beasts The Crimes of Grindelwald (movie trailer). 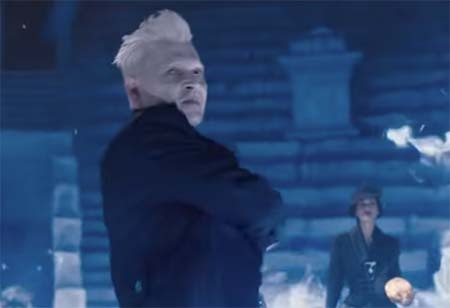 Fantastic Beasts The Crimes of Grindelwald (movie trailer). More JK Rowling-derived fantasy mayhem in the Fantastic Beasts movie follow-up, Fantastic Beasts The Crimes of Grindelwald, rides a broomstick into your local cinema on November 16th 2018. The film features a cast led by Eddie Redmayne, Katherine Waterston, Dan Fogler, Alison Sudol, Ezra Miller, with Jude Law and Johnny Depp. The cast also includes, Zoë Kravitz, Callum Turner, Claudia Kim, William Nadylam, Kevin Guthrie, Carmen Ejogo, and Poppy Corby-Tuech. « Godzilla: King of the Monsters (monster movie trailer).